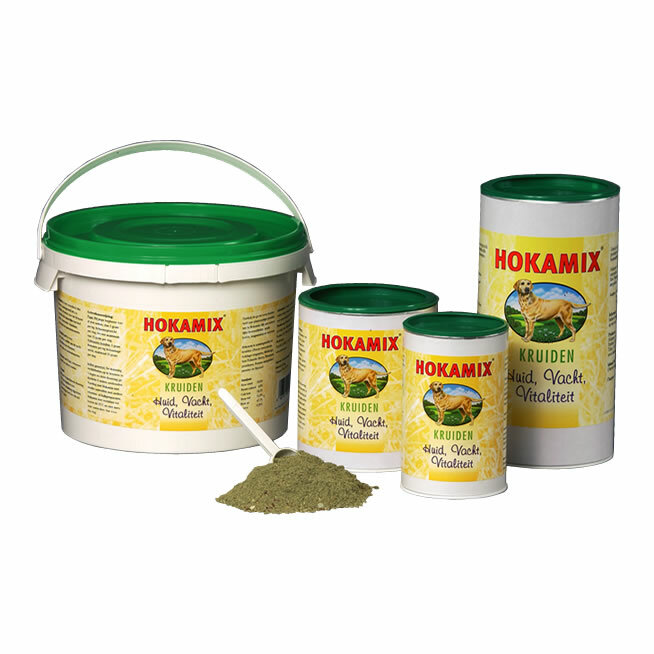 Hokamix is made in The Netherlands and has been the same original recipe of herbs since 1980s. 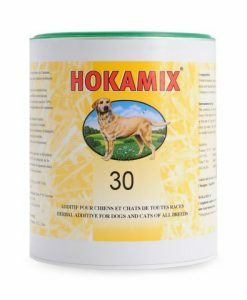 Breeders, Trainers and Veterinarians throughout the world realize the power of Hokamix 30, the #1 pet supplement in Europe. 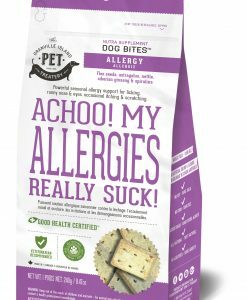 Now your dogs can look, feel and perform their best with this unique ALL NATURAL herbal blend. 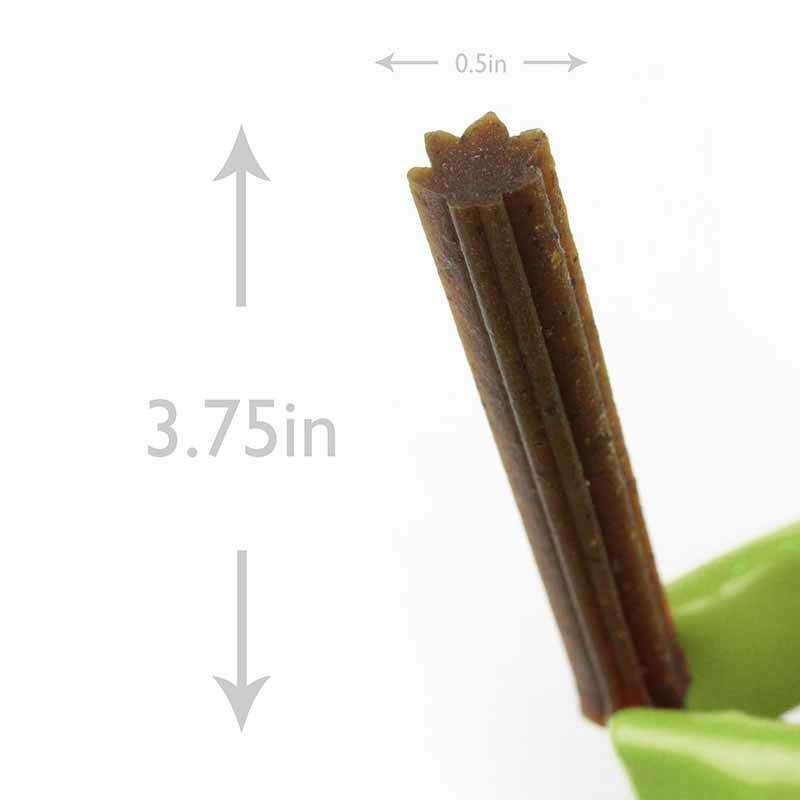 Hokamix 30 contains balanced vitamins, antioxidants, minerals, enzymes, amino acids, chlorophyll, trace elements, essential fatty acids and other nutrients found naturally in Dandelion, two different species of Kelp, Alfalfa, Cayenne, Sage, Couchgrass and other beneficial herbs. 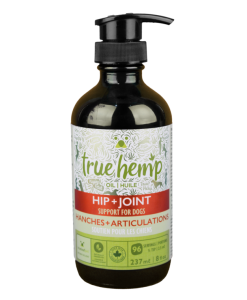 Each of these herbs has it’s own important function in the body, and this specifically formulated mixture is effective in boosting digestion and metabolism. 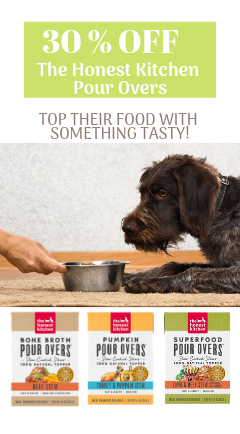 Feeding Guidelines: When first introducing, it is necessary to gradually work up to the recommended amount added to the food by increasing the amount added over a 1-2 week period, or adjust to bowel tolerance. 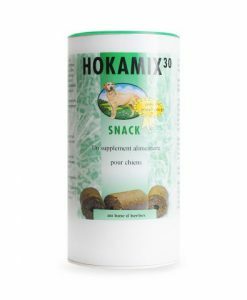 Dogs: the normal daily amount of Hokamix is one 5 gram scoop, found in each container, per 10 lbs. of body weight up to a maximum of 3 scoops a day. 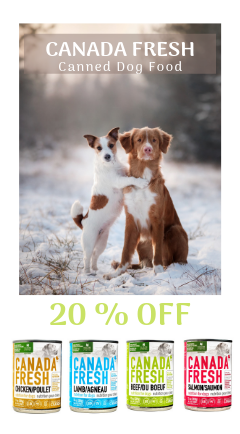 If your pet is fed twice daily the amount can be divided. 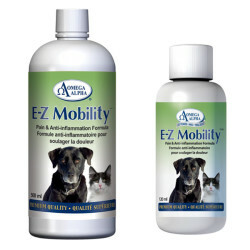 For dogs that have severe problems, hip dysplasia, arthritis, allergies, etc. 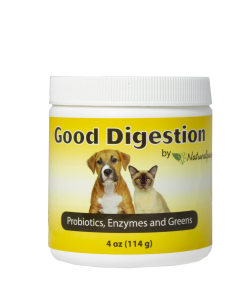 The amount should be doubled or taken to as close to double the recommended amount as the bowel will allow, for the first 6 weeks then returned to the normal maintenance amount. 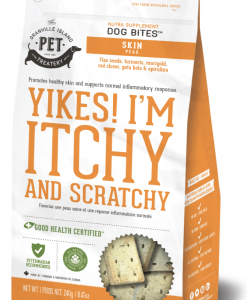 Hokamix, combined with a high quality food, will benefit pets of all ages. 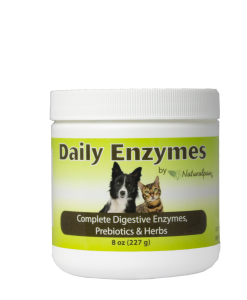 It can be mixed with raw food, any moist food or moistened dry food. I’m a first time purchaser of Hoka Mix and can’t write a review for long term usage, yet. 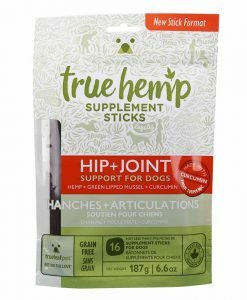 My dogs eat this mixed in their raw food and seem to like it. I’ve already noticed that their fur seems shinier after only a couple of weeks of use. 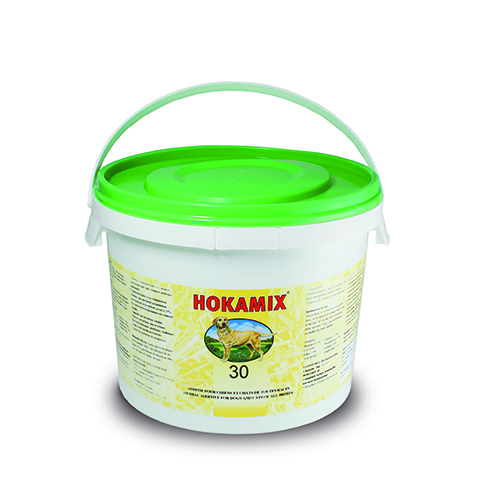 This is my second tub of Hokamix. 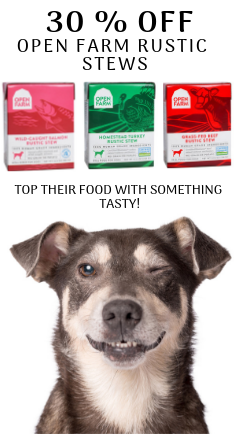 It had come as a recommendation from my breeder and my now 15 month old female shepherd, likes her bowl clean every time, She is on a raw food diet. Hips elbows perfect. coat shiny and teeth white and strong. 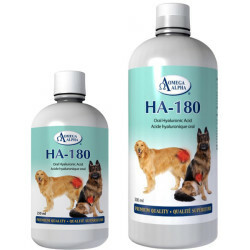 I have been using Hokamix On and Off since 1985 for my dobermans. 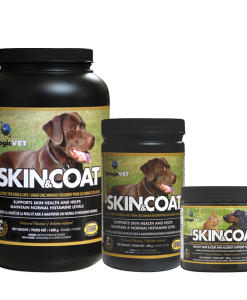 I always noticed improvements of the skin, stools firmness and overall health of my dogs. 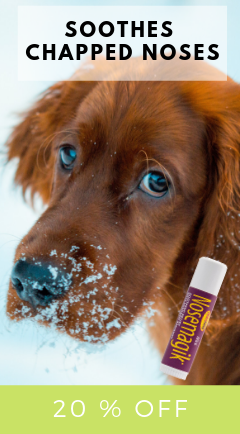 Now I raise dobermans and I give them Hokamix. 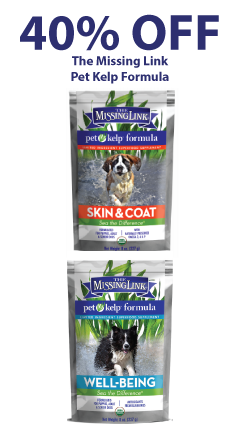 their coat are much nicer and I am sure they are getting all the nutrients they need. 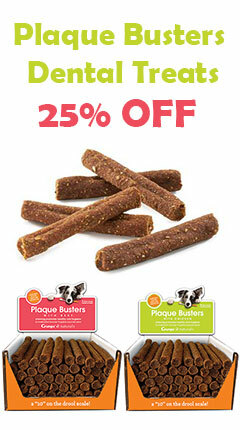 I feed them a variety of food mix with raw diet (chicken sardines, marrow bones). By giving them Hokamix, I am convince they are getting all the minerals and vitamins they need to stay in perfect health.